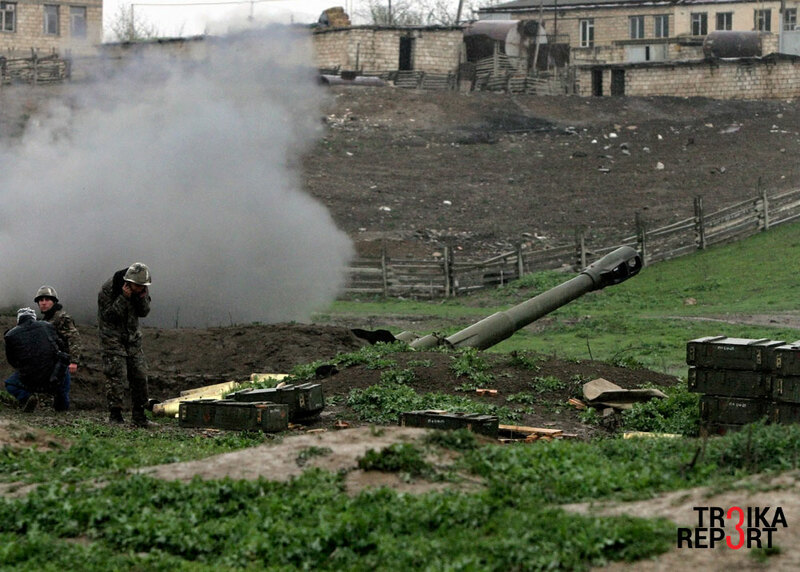 The self-defense army of Nagorno-Karabakh in Martakert, April 3, 2016. With the largest border clashes since 1994 pushing Armenia and Azerbaijan to the brink of a full-fledged war over the disputed territory of Nagorno-Karabakh, the recent developments that may have reactivated the latent conflict are now under the spotlight. The core reasons for the latest flare-up in hostilities between Armenia and Azerbaijan over the disputed region of Nagorno-Karabakh remain largely obscure. Yet several developments in the region in the last six or seven years have inadvertently contributed to Armenia and Azerbaijan inching toward a military conflict. Mismanagement of foreign policy has allowed bellicose rhetoric on both sides to spread the illusion of a military solution to the territorial dispute rooted in the self-proclaimed republic, an enclave constituting 21 percent of the territory of Azerbaijan that has been under Armenian control since a ceasefire in 1994 brought an end to a war over the region in the early 1990s after the breakup of the USSR. Part of the blame rests with the Minsk Group, charged in 1992 by the Organization for Security and Cooperation in Europe (OSCE) with finding an acceptable solution to the dispute. Negotiations are proceeding at a snail’s pace. The only excuse to be found is that territorial disputes, by definition, especially burdened with ethnic and religious overtones, are the hardest to deal with. The stalemate between Russia and Japan over the ownership of the South Kuril Islands is a case in point. The first warning trial balloon, most probably aimed to test the reaction of Moscow, was sent up into the air by none other than the highly reputed Azerbaijani ambassador to Russia, Polad Bulbuloglu. Baku seems to have been emboldened by the gradual build-up of its armed forces, capitalizing on the steady flow of oil revenues. Under the presidency of President Ilham Aliyev, which has lasted for more than a decade, the Caspian Sea state’s annual military spending has surged by almost 30 times. Last year, defense expenditures totalled some $3.6 billion – a figure that exceeds the entire Armenian state budget. Since 2010, Azerbaijan has purchased modern tanks, combat helicopters, air-defence systems, and other military hardware from Russia, spending some $4 billion in the process. Occasionally, Aliyev has boosted the nationalist feelings of his compatriots by claiming he would recover the “occupied lands,” i.e. Nagorno-Karabakh and the surrounding Armenian-controlled territories. Today, it looks like he wants to honor this pledge. With a 2015 defense budget equivalent to about $500 million, Armenia cannot match the military capabilities of Azerbaijan. It has long maintained the balance of power vis-à-vis its stronger neighbor by relying on its alliance with Russia. Yerevan concluded bilateral defense agreements with Russia and is a member of the Russian-led Collective Security Treaty Organization. In 2013, Armenia neglected the persistent overtures of the European Union to become its “associate member” and, instead, chose to join the Russia-led Eurasia Economic Union. In February, Russia provided a $200 million loan to Armenia to fund the purchase of new weapons. However, the list under consideration, as noted by Azerbaijan’s Trend News Agency, includes neither Iskander-M nor SU-30SM fighters, meaning there is no risk of tilting the balance of military power. Nevertheless, one element in the equation matters. Moscow recently deployed new MiG-29 fighters at its Erebuni military base in Armenia, close to the Turkish border. While it is quite clear that Moscow acts as a security provider for Armenia, the Kremlin also tries hard not to appear prejudiced against Azerbaijan. And this policy seems to irritate some regional actors. Is Erdogan playing Baku off against Moscow? In contrast, Turkish President Recep Tayyip Erdogan phoned only his Azerbaijani counterpart, Ilham Aliyev, to express his condolences over the death of Azerbaijani soldiers, thus taking sides, which was foreseeable. Against the dire state of relations between Turkey and Russia, with Erdogan basically being ostracized by the Kremlin, the reignited conflict over the disputed Caucasus enclave gives Moscow yet another headache and could well count as a point scored in the psychological warfare between the two states. Ankara has nothing to lose but stands to gain should Moscow become entangled in complicated diplomatic manoeuvres in order to pacify both Armenia, its staunchest and most formal ally in the region, and Azerbaijan, which continues to maintain a privileged relationship with Russia. Moreover, should Moscow make a faux pas, abandon its balanced approach to the warring parties and show favoritism to Armenia, it would most certainly alienate Azerbaijan, to the joy of the present Turkish leadership. Damaging in some way or another the relations between Baku and Moscow seems to be one of the motives of encouragement provided by Turkey to Azerbaijan at a moment when the UN, the OSCE, and major world powers are calling for restraint. Trying to identify the main culprit in the re-eruption of violence in Nagorno-Karabakh, that is, who fired the first shot, could well be futile. However, the opinion of Thomas de Waal of Carnegie Europe should be duly noted. “It is more likely that one of the two parties to the conflict – and more likely the Azerbaijani side, which has a stronger interest in the resumption of hostilities – is trying to alter the situation in its favor with a limited military campaign,” De Waal wrote in a blog posting. “The dangerous aspect to this is that, once begun, any military operations in this conflict zone can easily escalate and get out of control,” he stressed. Moscow is winding down its presence in Syria. Why? Why now? A serious danger may lie in the provisions of the 2011 Agreement on Strategic Partnership and Mutual Support between Turkey and Azerbaijan. The parties pledged to render support to each other using “all possible means” in the event of an attack or aggression against one of them. Getting involved in yet another conflict would buy additional time for President Erdogan as it allows him to further stoke ultra-nationalist feeling at home. No less worrisome is that the conflict is acquiring religious connotations. The Organization of Islamic Cooperation (OIC), has condemned “the attack by Armenian forces on the borders of occupied Azerbaijani territories” and Yerevan's “disrespect of the (unilateral) ceasefire” announced by Baku. Azerbaijan is a member of the OIC, and is receiving support specifically as an Islamic nation. However, the international, both regional and global, context makes the conflict around Nagorno-Karabakh not just a risky adventure but a geopolitical mistake for the warring parties. Actually, this is the crucial riddle. Why? Neither side is naïve or reckless enough to believe that the Nagorno-Karabakh dispute has a military solution. Why would Azerbaijan and Armenia take up arms? For them it is a lose-lose situation. Just as it is for Russia, which is unhappy with the continuous animosity and squabbling in its soft underbelly.